"My preference for dessert is a lot of fruit with a little something," says star blogger and baker David Lebovitz. And so he came up with these wonderful little vanilla cakes, which he douses with rum syrup, then piles high with citrus fruit and whipped cream. Also known as cucciddatu, cudduredda and a variety of other names in Sicily’s consonant-rich dialects, this ring-shaped cake consists of a perforated short crust packed around a dense filling of dried figs, raisins, almonds, pistachios and dark chocolate. The most festive versions also feature an array of brightly colored candied fruits, both inside and out. Torrone is a broad category of sweets that has found its way, in one form or another, to every corner of Italy. From soft and chewy blocks of nougat to hard, dental work–threatening nut brittles, torrone’s origins are variously ascribed to Greek, Roman, Arab and Spanish conquerors. The most common incarnation features whole toasted nuts sheathed in an amalgam of egg whites, sugar and honey. Made in Puglia and the bordering regions, these nests of fried dough ribbons are soaked in honey, fig syrup or reduced wine must, giving them a tacky texture. Today, the crimped dough strips represent the baby Jesus’ swaddling clothes or the crown of thorns, but locals claim the sweet has pre-Christian origins stretching back to ancient Greece. Made in Naples and across south-central Italy, these peanut-size fried dough balls are dressed in warmed honey, then are arranged in pyramidal piles. Variations call for a liqueur-enriched dough, but virtually every serving of struffoli comes embellished with colored sprinkles. Since its invention in Pescara in 1920, the domed, dark chocolate–clad parrozzo has become synonymous with Christmas in Italy’s Abruzzo region. Playfully seeking to evoke the dark-crusted local cornbread (called “pane rozzo”), pastry maker Luigi d’Amico conceived of an egg-rich cake coated in a chocolate shell. Local artists and writers championed the local product and immortalized it in art and literature, leading to its diffusion throughout Abruzzo. According to local bakers, this dense fruitcake has ancient origins stretching back to the Roman Empire. They use a combination of almond flour and honey to bind together a mixture of toasted almonds, walnuts, pine nuts and pistachios, to which they add raisins and dark chocolate chips. Pangiallo’s name, which translates to “yellow bread,” is derived from the color of its baked egg wash. This yeasted, egg-rich cake is baked in eight-pointed molds, producing its distinct shape. Although pandoro originated in Verona, its production has spread across Italy thanks to industrial production and now it ranks alongside panettone as the country’s most widely consumed Christmas sweet. The butter-based dough may be perfumed with vanilla, citrus zest or other aromas (naturally, the location of production determines whether these are natural or not) and the cake is traditionally served dusted liberally with powdered sugar. Thanks to the medieval and Renaissance spice trades, seasoned fruitcakes—called panforti—have been made in central Italy for centuries. Panpepato, a type of panforte, is liberally spiced and produced from Ferrara in Emilia-Romagna to Siena in Tuscany. As the name suggests—pane is bread, while pepe means black pepper—panpepato employs piquant black pepper in its spice mix, which may also include cinnamon, coriander or nutmeg alongside almonds, pine nuts, hazelnuts, walnuts and citrus zest. The cake’s dark color comes from reduced grape must or cocoa—or both. This roughly cylindrical yeasted sweet bread may have originated in Milan, but industry has transported bad factory-made versions across Italy and the world. Some traditional bakeries still make panettone in the traditional way, dedicating more than two days to the lengthy process of naturally fermenting, proofing and baking the dough, followed by a final 24-hour resting period. In such cases, a thin, browned crust gives way to a soft, spongy interior studded with candied fruits and raisins. 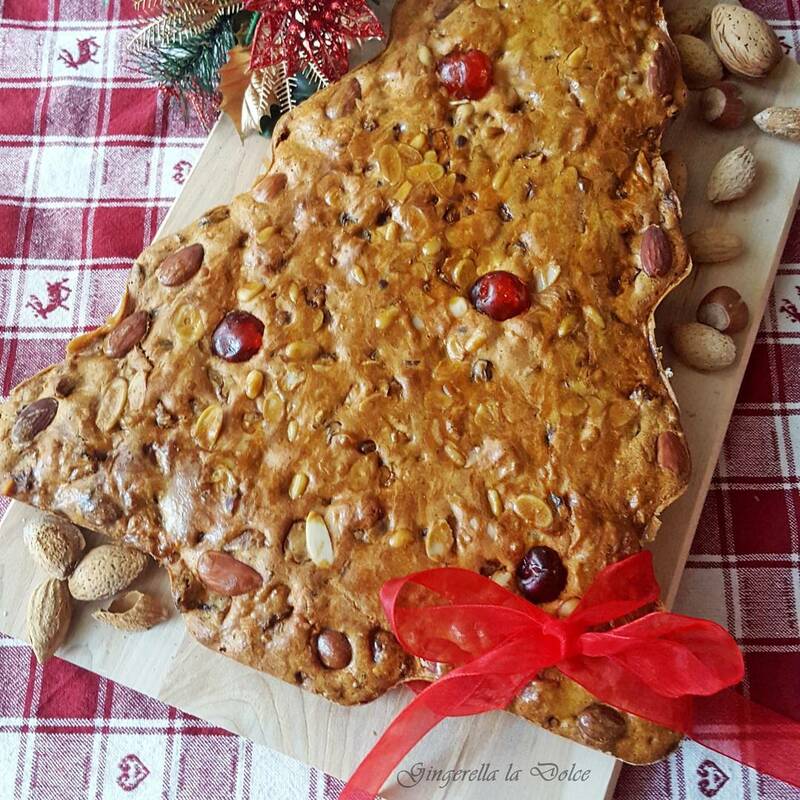 In the shadow of the Dolomites, bakers from the neighboring regions of Trentino and Alto Adige prepare this whole-wheat cake loaded with dried fruits and nuts. Some versions are boozy, spiked with rum, brandy or grappa, while most are decorated with geometric patterns of additional dried fruit and nuts.